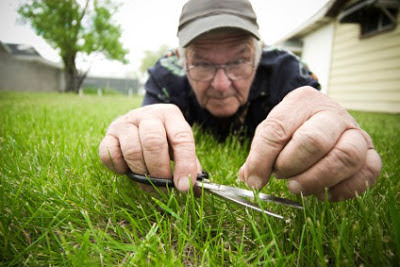 searching Google images for Crazy Gardeners! Coincidence or fate. A week after I posted 'America's Most Influential Gardeners' I found out that one of my top nominee's was slated to be speaking nearby! 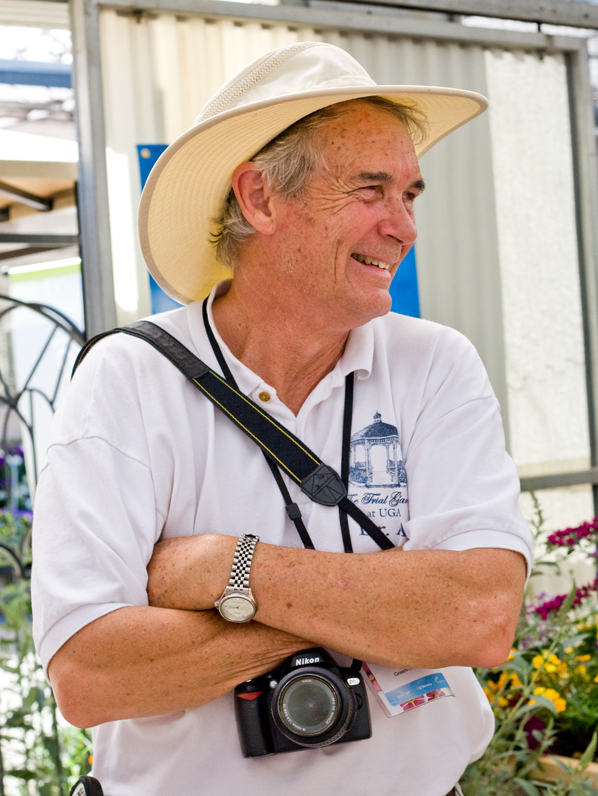 That person was Allan Armitage, a Perennial plant guru among other titles, and last Tuesday evening he lived up to his 'Most Influential' status! 'Crazy Plants for Crazy Gardeners' was the subject for the evenings presentation. It was based around plants only a gardener would love. His story of sitting in the garden at dusk with a bottle of wine, watching the blooms of an Evening Primrose to begin to pop open wasn't lost on me. It's an event that any gardener can relate to, but to the uninitiated it sounds bizarre. I've seen someone else doing the same with a bottle of Champagne and a night blooming Cactus, but I think she would of found the excuse to have a drink regardless of the event. Lets face it, we gardeners are in fact a 'crazy' bunch. We're fanatical, passionate and obsessed and often do the most bizarre things. I've been known to garden during a full moon, not for some astrological significance but because the light of the moon allowed me to see outside and carry on gardening. I'm sure the neighbors all think I'm nuts digging in the dark, or maybe they think I'm up to something more menacing? Obsession can be a curse when it comes to lawns too. We've all seen the signs not to walk on the lawn in fear that are shoes would cause it some harmed. But, if you step back and detach yourself from the world of gardening, what other pastime recommends you to buy bags of poop to increase your enjoyment of the subject matter! Allan kicked off the evening with what seemed like a collection of thoughts. Some geared towards the garden center, who was hosting the talk, and some for the group who was attending. But, what resonated the most was his concern that ordinary people had developed a disconnect from the outside world, favoring instead a world of high-tech gadgetry. I have written past posts regarding this subject in 'What happened to gardening', but to hear someone of his standing echo the same sentiments is alarming. One way he suggested we might change peoples opinions about gardening is to tell them the stories connected to the plants we use. Many of the plants in our gardens have remarkable stories that have changed history, whilst others have gone as far to of built empires. If you get someone to see that plant are more than just some pretty flowers in a pot, they'll have a greater appreciation of what that plant really means. 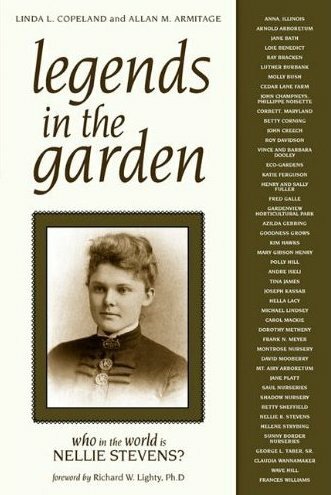 Many fascinating stories can be found in the book 'Legends of the Garden, Who in the World is Nellie Stevens', that Allan coauthored with Linda Copeland. A well recommend read for anyone interested to learn more. A side effect of gardening, that any don't think about is how it affects are health. Allan remarked how you'll never find an old gardener. You'll find broke gardeners, sore gardeners, good and bad gardeners but never old gardeners. Why not? Because a gardener is always looking towards the future in anticipation. Gardeners are the optimist of the world, never letting one years failures hold us back. Instead, we build on our experiences each year and look forward to see what the next year will bring. The term 'crazy' is a little misleading as its our passion for growing gardens that makes us this way. This perception could be one of the reasons people get turned off from gardening. Let face it were not exactly 'Hip' or 'Cool', but the deep sense of connection I have with my environment far transcends the fashionable tags we put on things. Maybe the answer could be found in Allan's last photo of the evening. It showed a young child in his garden running off with his famous Tilley hat in hand. My interpretation of this picture as gardens were not just for growing flowers but future gardeners too. Encouraging children to explore the garden gets them interested early. I excepted that my children will decorate mud pies with flowers they pick from the plants I've nurtured, or that when a plant gets crushed in a game of tag it will grow back. To see how easily they become mesmerized by the wonders of gardening gives me joy beyond the anticipation of that Paper Bush beginning to bloom. Thanks to Allan's talk my daughter is now obsessed with wanting to grow a Giant Jack Bean this summer and I'm sure my son would love a dinosaur gourd too. We all need to embrace this awe they have for nature because if we don't they grow up only cultivating their Facebook status instead of their own small piece of this planet. But that's just all 'crazy' talk......or is it? It's not crazy at all! I'm growing purple pole beans this summer just because I can. My ability to go outside and simply enjoy nature is directly connected to my mood and sense of wellness. I wish I'd been at the Armitage talk. Big sigh.... Your son is adorable! :o) What's growing behind the lavender? Thanks for your comments. I have a Fig 'Chicago Hardy' behind the lavender that is a good producer for a plant a few years old. We had a good time last year eating them fresh from the bush. My son loves watching the bees buzz around but always keeps a safe distance. Allan's talk came at the right time, a rallying call for spring. I couldn't get to his afternoon session but the even talk was perfect. Hopefully he'll be back up this way again, I'll keep you posted if I hear anything. The enthusiasm and wonder of gardening comes through in all of this post --- both Allan's comments and your own observations. How great that you got to hear him and get pumped up by his talk. And thanks for the book recommendation -- it's one of the things I always wonder when I buy a named cultivar. I ordered the book! I arrived at the talk exhausted from a days worth of work and feared I was going to slip off to sleep during the presentation. However, Allan had a way of keep your attention focused and by the end I was energized to head out into the garden and start working, even if it was dark. I do a lot of seminars through my work at a garden center and watching Allan present taught me how to do it better. I highly recommend going to one of his if you have a chance. Gardening is sometimes maybe a coverup to playing in the dirt. Yesterday my younger kids and I mixed soil and compost and coco-fiber in a container on our roof, in order to fill a few more pots and transplant our tomatoes. My son had such a good time and told me gardening was the best fun. Then I found my daughter putting her feet in the soil. She felt a bit embarrassed after I discovered it, and couldn't fully explain why she did it. We miss our garden, but found a new way to enjoy nature. Our roof is starting to look more like a container garden than a part of this concrete jungle. One of our sons commented, after we invested in some pots and plants and seeds, that finally this place had become home. I love to see the shock on people's faces here when they see me dirty. I have finally convinced some people that getting dirty is not just for a few select who in this culture feel inferior. And I love to see my house helper, who once with her husband had a farm and through drought lost it all, come from declaring me crazy to realizing that things do grow in pots and it is okay to mix vegetables and flowers in one pot; and yes, even in this city with its horrid climate, we can at least try. There is so little information in North India on plants, and growing. I made a few 'friends' in nurseries. Those little wiry men seem to like flowers, but they themselves know relatively little. Grass does make you high!